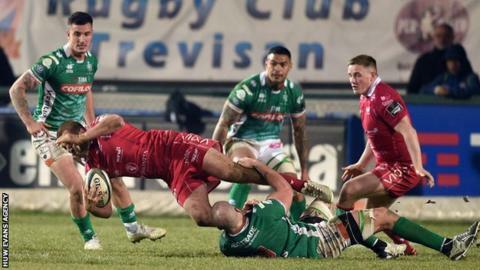 Coach Wayne Pivac has queried the role of independent medical advisors after Scarlets' Pro14 defeat by Benetton. Scrum-half Kieran Hardy and back rower Josh Macleod were taken off despite being passed fit by Scarlets medics. Pivac believes the temporary loss of the players for head injury assessments, complicated by language problems, influenced the scoreline. "To take guys off after our guys have checked and cleared him, I find strange," he said. "HIAs aren't my favourite subject at the moment. "We'll go through a process with our medical team of reporting it through to the Welsh Rugby Union - it's information for the powers-that-be to hopefully make improvements for next season." Scarlets - champions in 2017 - are fifth in their Pro14 conference going into their home game against Cheetahs. Scrum-half Jonathan Evans has been ruled out for the rest of the season with an ankle injury, while lock David Bulbring will miss all the regular season league games. Pivac has labelled Sunday's match against the Cheetahs as a "must-win" for their hopes of reaching the Pro14 play-offs, after slipping five points off third place. But he hopes that having all six remaining games in Wales, four at home, will benefit their chances. "There's still a lot of games where there can be massive swings [in the table], and our run-in isn't too bad when you look at a couple of the other teams' run-ins," he added. "For the last month of the season I think we'll be a lot stronger with some of those injured boys coming back." Wales back-rower James Davies (foot injury) is due back against Cardiff Blues on 22 March, while fellow flanker Aaron Shingler is running again after a lengthy absence with a knee injury.